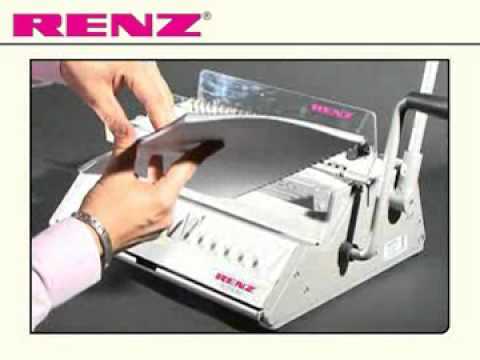 The RENZ Eco S 360 is a combined manually operated punch and closing machine for One Pitch® wire comb binding in 2:1 pitch. The universal manual punching and binding machine with the ergonomic two-lever system and easy-to-use auxiliary functions. 28 selectable punching dies, variable margin for adjusting to format perfectly, up to 36 cm. Punches up to 25 sheets (2.5 mm) and binds up to 340 sheets. The new RENZ® system means that even inexperienced operators can now produce perfect wire comb bindings. The equipment is now more ergonomic, with all steps in the process more user-friendly than ever. With the Eco S 360 for the first time, it is now possible to close books up to 38 m (1,5") with a desk top wire binding machine. The Eco S 360 provides ergonomic work flow from top to bottom. There is a wire holder for the binding elements and pages can be comfortably and easily inserted when binding. Closing is possible up to 38 mm = 1 1/2". Thanks to its modular construction, the eco S 360 can be upgraded with an electric drive, creating an electric punch and manual closing machine and the best cutting pressure ratio is produced. Compact, strong construction quality made in Germany.